A pal brought me back a bottle of this when he returned from a trip to see his family in Mumbai. I’m not sure what I did to deserve the honour, but I was happy to receive it. I’d never tried Indian wine before, and my adventures in Chinese and Thai wine had not been good, so I didn’t have the highest hopes. 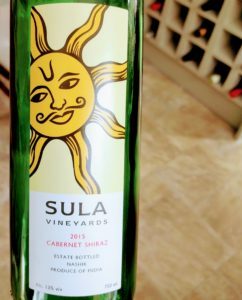 The Sula Vineyards Cabernet Shiraz ’15 wine was a bright, purple red, if it was curtains you’d call it Burgundy, but that would be a bit misleading as it was darker than a Burgundy wine, but maybe not as dark as a Bordeaux. It smelled interesting, there was definitely lots of fruit, but it wasn’t as baked as I thought it might be, there was even just a hint of green leaf among the smells. The wine left good strong legs on the glass. It tasted, well, different at first. Had it been a blind taste I’d have plumped for it being pinotage. It had a smoky, burned taste that dominated, so I decanted it to give it a bit of a chance. Coming back half an hour later, it had softened, it was more charcoal, with some cigar type flavours, but the fruit was poking through with a blackcurrent sweetness. It softened slightly more into something that was almost meaty, Marmitey, in a good way. In the course of a couple of glassed it had moved from a slightly overwhelming smokey flavour, through to a a marvelous Marmite and Guinness on a bowl of black fruits kind of flavour. I’d certainly recommend decanting this wine and letting it sit quietly contemplating it’s future for an hour or so before drinking, it really does come in to its own. At 13% it’s middle of the road in terms of alcohol, but with those tertiary flavours going on it has more mouthfeel than that. The producers recommend chilling it slightly, but I live in the English Midlands, everything is chilled slightly, so I probably wouldn’t bother except on the sunny day we have in July.